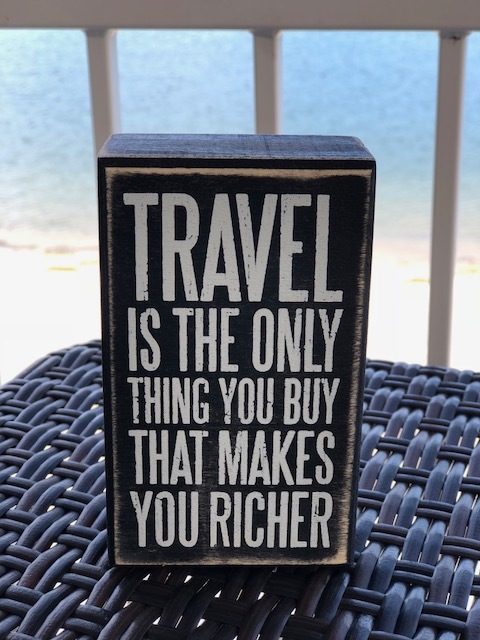 Travel can make you rich in a way that nothing else can. It allows you to break habits, give yourself time to heal, reduce stress, expand awareness, and gain a new enthusiasm for life. It helps you rediscover the real you. As Rachel Wolchin said, “If we were meant to stay in one place, we’d have roots instead of feet.” Instead of repeating the same life experience every year for ten, twenty, or forty years, travel can give us dozens of life-changing encounters in only one year. Travel is the difference between reading one page of the “world book” and reading the entire thing. So, come out of your bubble and into the real world. Travel awakens your “inner child” by offering new, first-time experiences. It stokes your curiosity. But keep this in mind: “A foreign country is not designed to make you comfortable. It’s designed to make its own people comfortable.” –Clifton Fadman. Yes, travel is inconvenient. But when you’re away from the unfamiliar, you’re open. And with a heightened state of awareness, you’re ready to tackle new experiences. If it scares you, it will also challenge you, so go for it! A few words of caution, however: travel can be addicting. “Once the travel bug bites, there is no known antidote, and I know that I shall be happily infected until the end of my life.” –Michael Palin. Michael is talking about the traveler’s rush that hits you upon arrival to a new place. Like an elixir, the more you expose yourself, the more you want it. I admit to passionate affairs with destinations. I tend to fall in love with one country until I find another that I love even better. To me, reaching a destination with a purpose is so much more important than crossing countries off a list. That’s why I prepare so much—reading, researching, discovering all I can. I want to engage fully with the culture I’ll be in. And after you’ve been in many cultures, you’ll find that all people around the world, while different, are in many ways the same: They laugh, love, cry, eat, learn, and die. They care for family first, then their community or tribe, and want an even better life for their children. If you’re a person who learns best by doing, then go and explore this varied and wonderful world. 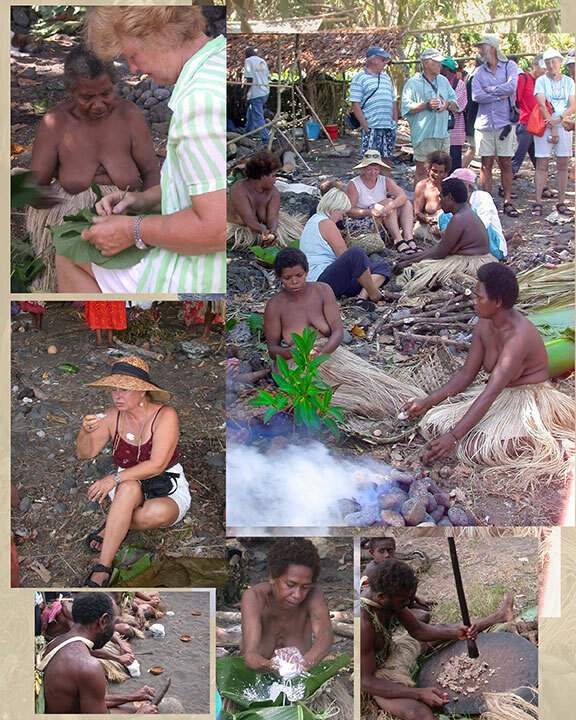 While attending a festival in the Northern Banks islands of Vanuatu, we yachties learned how to weave using plants and to make kakai (island food), and laplap. “To see how you live,” I answered. She shook her head, surprised. I took a loaf of warm pumpernickel bread out of the BreadMaker, cut it into ample slices, lathered them with honey, and handed everyone a slice. Before long, the entire loaf was gone! This couple had never tasted bread before. “This…our laplap,” the woman said. “We bake in ground. Put fish on top.” The next day, the local women showed us yachties how to make laplap. If you’re a foodie, you’ll love to experience the different dishes prepared around the world. And don’t hesitate to take local cooking classes whenever you can. You create lasting memories when you open your horizons to different and unique cultures, cuisines, and landscapes. And many of the friends you meet “on the road” continue to be your confidants many years later. Once you’ve taken the plunge, you’ll be surprised at the ways you’ve changed. Be sure to take a travel journal with you so you can document your transformation. Who knows? 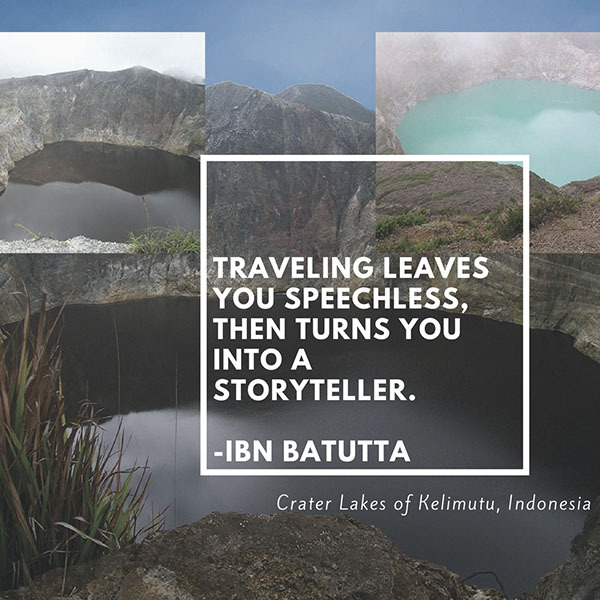 Your next trip just might turn you into a storyteller! Travel is not the reward for working; it’s an education for living. In fact, many Europeans view travel this way and take a year off between school and work to travel. It’s a time for new graduates to think on their own without others telling them what to do. Distance provides perspective and opens young minds to what’s really important. To travel is to evolve. Traveling Develops Character; It Opens the Mind. And that’s not all bad. To Gunter and me, at this stage of our lives, travel is life, and life is travel. It’s as much a part of our makeup as the books we read and the food we eat. Sure, we love to spend time with family and friends, and we enjoy other activities, but to suggest that we stop traveling would be like saying we’ll stop learning, growing, and living our dreams. About the Author: Embarking on an eight-year adventure at sea, former human genetics and biomedical technology CEO, Lois Joy Hofmann sailed around the world on a 43-foot catamaran with her husband, Gunter. Discovering the thrills, dangers, and bliss of the cruising life, she shares their passions, experiences and knowledge learned and Lois inspires others to “Follow Your Bliss”; you’re never to old to fulfill your dreams. Sailing the World Travel Trilogy Book Special Now Available to the Public for a Limited Time! Description: This thoughtfully written, beautifully illustrated Trilogy documents people and places around the world. Containing hundreds of color photos, these coffee-table- sized books are all three now available to the public.